I’ve set up a WordPress site for a client and have had no end of troubles trying to get the site to behave – however there seems to be a constant problem of WordPress hanging. Open up your blog site and log on in the normal way. Now just go to the top of the page and click on Screen Options. Disable the widgets that show an error message and all will be right with the world once again! It’s a bit of a pain, and I haven’t managed to get to the bottom of the problem as I am never in charge of hosts where the problems lie. However, this workaround will at least get you going with your blog without any more hassle! Being a sucker for all kinds of eye-candy, I’ve been running the latest builds of Compiz-Fusion. I’ve got to say that it is fantastic and makes the desktop experience a much more pleasurable one. One of the things that has caused an issue is that the Application Switcher plugin (ALT+TAB) keeps on switching to every second window. Very annoying if you have only an even number of windows on the desktop. Today, after breaking Compiz with an update, I managed to get it behaving itself by essentially reinstalling it – but the fix for the application switcher is even easier! If you have multiple entries for the application switcher (like in this screenshot), you need to make sure that YOU ONLY HAVE SHORTCUTS SET FOR 1 GROUP. 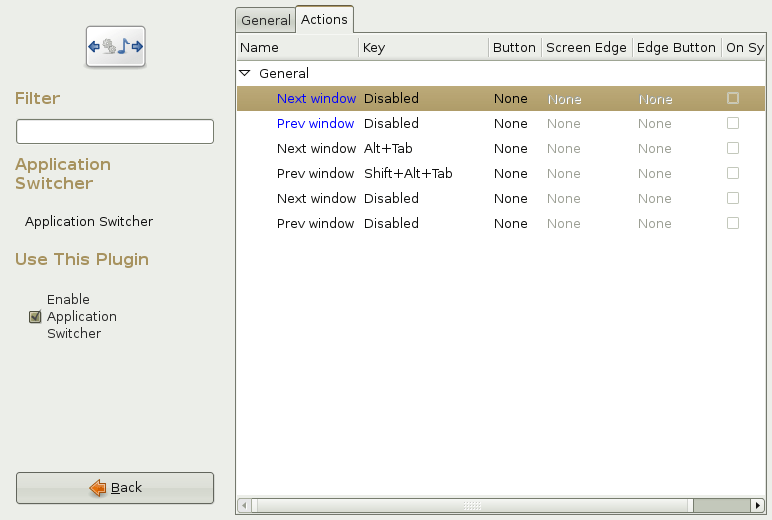 Once you have cleared the settings so that only one ‘Next Window’ and ‘Prev Window’ shortcut is used, test it out. And that is it! I think that the only reason that it became an issue was that some settings were inherited from Beryl. After the recent Feisty kernel update, I found that I couldn’t access a USB drive without using root privileges in the command prompt. You are not privileged to mount the volume ‘drivename’. <code>[ 1025.759465] NTFS-fs warning (device hde1): parse_options(): Option utf8 is no longer supported, using option nls=utf8. Please use option nls=utf8 in the future and make sure utf8 is compiled either as a module or into the kernel. [ 1026.098973] NTFS volume version 3.1. For me, the connection is the ntfs-fs error and the list listed drive. The error says that I can’t use UTF8, so it’s stopping before it mounts the USB drive. If it works, great. If not, run dmesg again, and check the error is the same – then comment out the appropriate entry again. This is mainly to do with recent kernal upgrades, which are changing a number of features. I’m sure it’s good in the long run!